Agent Pierce is a member of Stasis, an organisation of time travellers who have tasked themselves with the preservation of humanity and the recording of humanity’s history. His initiation into Stasis was to murder his grandfather – effectively writing himself out of the history books. When he survives an ambush, he is contacted by a doctoral researcher he eventually marries. But things fall apart when he travels through time to the Final Library and finds no record of the time line in which he marries the researcher. I really really enjoyed this story. 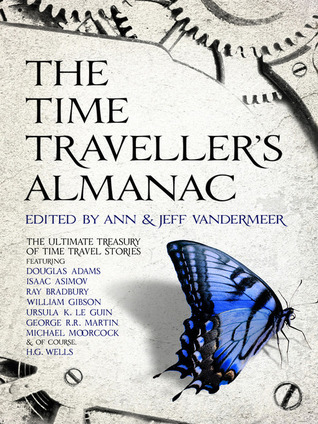 It certainly was a great way to end off my travels through The Time Traveller’s Almanac. In Palimpsest Stross creates an explosive cocktail of some of the themes I love best from scifi: deep time, time travel and the time travel paradox. While this novella is somewhat complex, at the same time it’s relatively simple. I could definitely see scope for it being expanded considerably, but I also like that Stross leaves some of the story to my imagination to fill in. Definitely a huge thumbs up to this story from this scifi fan.